As a Domain Owner, IALA requires interaction within the IHO’s Domain Control Body and the adherence to the timelines of the IHO’s registry management processes. 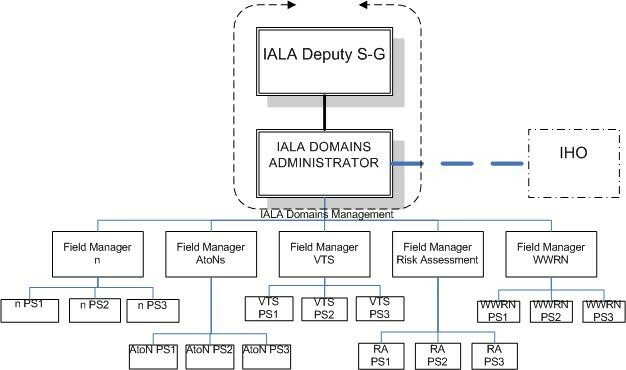 This activity affects the work of the IALA Domain Management and could lead to the involvement of IALA Field Managers and IALA Product Specification Developers. IALA Domains Administrator resides in the IALA Secretariat and coordinates the activities of each of the IALA Field Managers and acts as the single point of contact with the IHO. In the context of IHO Registry, IALA currently recognises the following Product Fields: AtoN information, VTS, WWRNS, IWRAP, etc. Each Field has at least one IALA product and one Product Specification. The IALA Field Manager harmonises the different products / Product Specifications within that Field. The IALA Field Manager also considers the usage of entries by others in his Field. IALA Product Specification Developer is appointed to manage each IALA Product Specification. IALA Product Specification Developer coordinates the development of an IALA Product Specification, coordinates the usage of existing entries in the IHO Registry that are used by that IALA Product Specification and coordinates the creation of new entries required by that IALA Product Specification. IALA Product Specification Developer is able to draw on any Register in the IHO Registry.